We offer all-inclusive honeymoon packages in the Caribbean, with luxurious accommodations and the best land and water sports - from golf to scuba, and an array of top gourmet dining options. When it comes to destination weddings, our team will help you design an elegant and fun celebration, without the stress. Experience an unprecedented level of perfection! 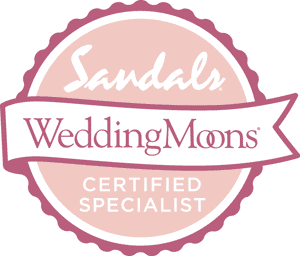 Simply click on the links below to get started making arrangements for a fabulous honeymoon or destination wedding at one of the many Sandals, Beaches or Grand Pineapple Beach Resorts in Jamaica, Antigua, St. Lucia, Turks & Caicos, Bahamas, Grenada and Barbados. Offices in Philadelphia, PA and Newark, DE. We serve clients everywhere!